It’s been a while since I did a Matchbox Major pack Monday. I have a few of these vintage models that I haven’t shown yet so may I present to you the Major pack M-4 Freuhauf Hopper Train by Matchbox. 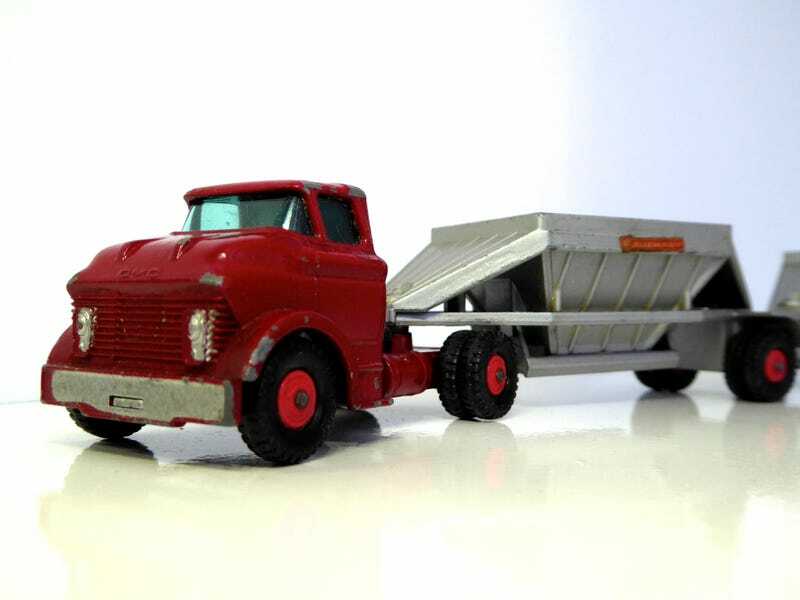 This model was introduced in 1965 and one of the few American made trucks that made it to the Matchbox casting. What’s that you say? Ok before Mattel. an American company became the owner of Matchbox, it was previously owned by Lesney which is based in England and a rival to Mattel’s Hot Wheels. Most of their models are British cars with a sprinkling of some American and other European cars. The tractor which is probably based on a 1964 GMC W6500 tractor is dark red with silver trim to the headlights and front bumpers. It came with 2 silver painted trailers and has opening doors in the floors of the hopper which adds to the play value. By the way both trailers were made of metal which would be rare nowadays. The wheels came in red plastic hubs which uses plenty of black tires including a spare at the back of the tractor unit. The first trailer is permanently attached to the tractor while the second one can be removed which is another great play value. Most likely kids would play with this on their sandbox or backyard where they can load dirt or sand on top of the trailers and roll the truck to an area where by using your fingers you can open the doors beneath and release your cargo. Definitely a great casting which may never be duplicated again (using mostly metal) without costing a bit of an arm and a leg. This has been found in my parents house so I was happy that this thing is still in good shape with some paint loss mostly on the front sides above the wheels. Here are some more pictures. Enjoy.